Your bedroom is your haven of peace, the one place that calls out to you after a tiring day at school or work. The design for your bedroom, therefore, should encompass all your personal tastes and requirements. Bedroom does not need to be the size of a football ground to give shape to all your design ideas. There is a lot you can do with a small bedroom as well. A combination of great textures, correct utilisation of space, and some genius tips and tricks can lend your bedroom the look you have always wanted for it. The space under your bed can be used as a great storage space. It maximizes utilisation of space, and you don’t have to invest square footage for a huge wardrobe. Store your bedding in the space underneath your bed, or you could even store the clothes you don’t wear in them after vacuum sealing them and then stacking them in boxes. Neutral shades are best for small spaces because they open up the room and make it look brighter. On the other hand, darker shades tend to make the room smaller. White, beige, and other pastel shades will create a nice aesthetic. For example, use beige cotton sheets, a white duvet, and beige pillowcases and paint the walls of the room in some subdued pastel shades. You don’t need to spend tons of cash to design bedroom well. There are a lot of everyday inexpensive things that can brighten up your room almost immediately. For example, have you ever thought about using a painted milk crate as your side table? It looks like a vintage piece of furniture. And costs about 1/4th of that. There’s a lot you can do with materials available at hand, and this works especially well if you’re on a budget. We all need tables and shelves, but they tend to take up a lot of space in the room. To prevent this from happening, you can actually choose to mount your tables and shelves on the walls. This way, every inch of your room’s space will be used, without it looking cluttered and over-crowded. Not only will this give your bedroom an extra trendy look, but will also make sure that you have ample amounts of storage options available at hand. 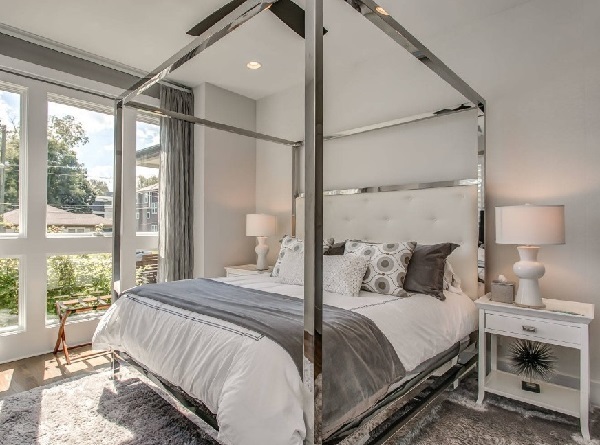 Read more: What is the perfect size of a bedroom? A good light fixture can brighten up your room without compromising its square footage. Position it in the centre of the bedroom for maximum lighting. You can use a single big chandelier to go for an aesthetically traditional vibe or opt for a bolder and trendier fixture to keep with the urban and modern look of the rest of your room. 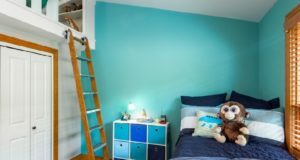 Colour blocking is one of the trendiest ways in which you can spruce up a small bedroom. Not only it saves space, but also adds an element of modern beauty. Colour blocking also lends a sort of structure to your bedroom. Include a lot of pastel shades like beige, brown, burnt sienna and the like. Balance it all out with healthy doses of white and you will end up with a room that looks and feels absolutely fabulous. The best part of owning your own bedroom is that you can design and decorate it in any way you want. With these subtle and bold design ideas, you can spruce up your bedroom and make it look absolutely amazing. Also placing gift items can make your room amazing. There are several brands online which provide best personalized gifts for anyone. Get your creative juices flowing and design your own space amazingly!